Reverend Dexter L. Davis Sr.
Gabrielle Elise, a Graduate of Howard University and Matthew Emmanuel a Junior at Delaware State. Reverend Morris was Licensed to preach the gospel on March 4th 2012, and Ordained on June 12th 2016. She has been teaching and preaching the word for over ten years. She is a noted retreat speaker, Bible study teacher, marriage counselor and the Ministry Leader for the Women's Discipleship Class. 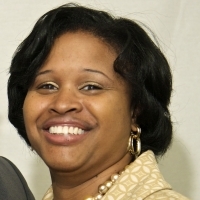 She was educated in Philadelphia, where she has earned a Bachelors of Science in Education from Drexel University, and a Masters in Educational Leadership with her Principal's Certification from the University of Pennsylvania. She was a math teacher and the Director of the Rose Tree Media School District Summer School and Enrichment Program. Presently she is Vice Principal of Tredyffrin Easttown Middle School.